Successfully Added Vehicle Air Freshener and Purifier - Solar Powered to your Shopping Cart. 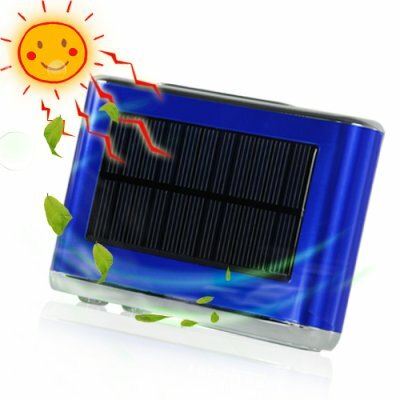 Vehicle air freshener and purifier comes Solar Powered and built with an all round stylish metallic blue aluminium finish. This model helps purify the air in your car and emits a wonderful array of potpourri scents. We all hate it when we're driving in heavy traffic and horrible aromas from other cars nearby fills up our car. The smell is instantly unbearable. This is just one of the many ways nasty odors get into our cars when driving. Whether driving past power plants, dirty rivers or factories. Most built in vehicle air purifiers are not powerful enough to block out all these nasty smells. Built with a solar panel on the top of the unit, you can place it on your car's dash boar, along with the place matt provided for stability. This model uses the HEPA filter technology, which allows the solar air purifier to be strong enough to tackle any outside odors such as dust, allergens, pollution, while keeping the air you breathe in your car clean and fresh. The HEPA filter consists of a special carbon filter, allowing for maximum air purification. This is a portable solar vehicle air purifier and freshener. Located at the back of the unit, is a little pocket which holds small potpourri pellets that are made from various flower fragrance. The CVIE-S06 comes with a 12v DC input for your car cigarette lighter, but you will hardly need to use it on DC power. This amazing solar air purifier and freshener will make and excellent addition to you cars internal atmosphere. It will provide you and your passengers with a healthy, clean and fragrant environment. This hot new item is available in stock now. So get yourself a few units, use one for yourself and sell the rest on eBay or your local town market to cover the cost of your one and the shipping. The solar vehicle air purifier and freshener is available to you for single or bulk purchases, from the leader in factory direct wholesale electronics, Chinavasion. Can I use any type of potpourri, or does it have to be the same once provided? You can use any scented potpourri you like. Just make sure they come on pellets. Can I also use the solar powered air purifier and freshener in the house? Yes you can, but you will have to recharge the unit using day light.